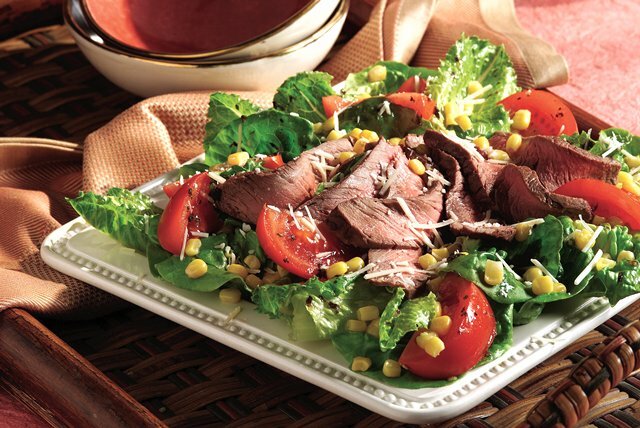 Discover your new favorite salad recipe with this scrumptious Balsamic Steak Romano Salad. Shredded Romano cheese is the perfect finishing touch for this hearty yet elegant Balsamic Steak Romano Salad. Preheat grill to medium heat. Grill steak 7 to 8 min. on each side or until medium doneness (160°F). Cut steak across the grain into thin slices. Toss greens with the tomatoes, corn and dressing. Place on serving platter; top with meat. Prepare as directed, substituting 4 boneless skinless chicken breasts for the steak. Prepare as directed, using DIGIORNO Shredded Parmesan Cheese. Broil steak instead of cooking on the grill.